When I first worked for a (student) newspaper, the job of a publisher seemed odd to me; as far as I and my editorial colleagues were concerned, the publisher was the person the editor-in-chief, who we viewed as the boss, occasionally griped about after a few too many drinks, usually with the assertion that he (in that case) was a bit of a nuisance. That attitude, of course, was the luxury of print: whatever happened on the other side of the office didn’t have any impact on the (in our eyes) heroic efforts to produce fresh content every day. We were the ones staying in the office until the wee hours of the night, writing, editing, and laying out the newspaper that would magically appear on newsstands the next morning, all while the publisher and his team were at home in bed. The moral of this story is obvious: the publisher represented the business side of the newspaper, and the effect of the Internet was to make the job and impact of editorial easier and that of a publisher immeasurably harder, in large part because many of a publisher’s jobs became obsolete; it is the editorial side, though, that has paid the price. 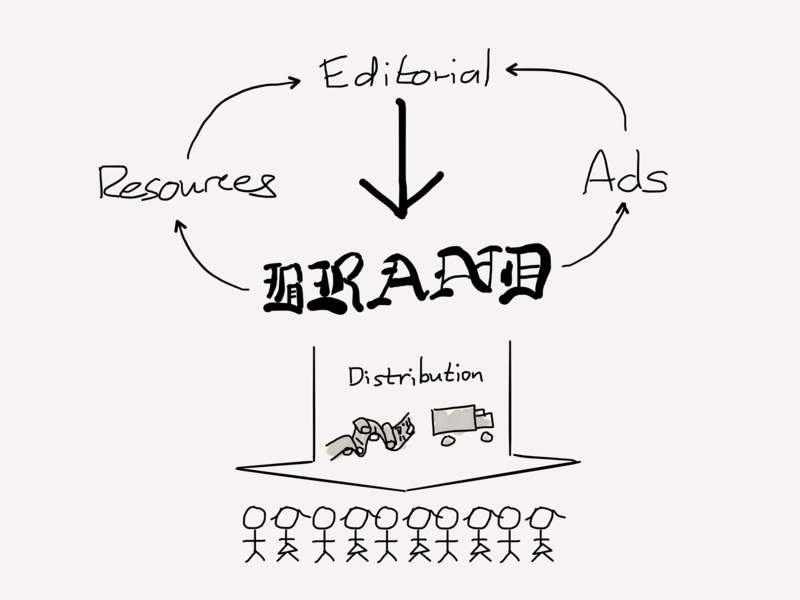 Brand: A publisher had a brand, specifically, the name of the publication; this was the primary touchpoint for readers, whether they were interested in national news, local news, sports, or the funny pages. Revenue Generation: Most publishers drove revenue in two ways: some money was made through subscriptions, the selling, administration, and support of which was handled by dedicated staff; most money was made from advertising, which had its own dedicated team. Human Resources: Editorial staff were free to write and complain about their publishers because everything else in their work life was taken care of, from payroll to travel expenses to office supplies. Each of these functions supported the other: the brand drove revenue generation which paid for editorial that delivered on the brand promise, all underpinned by owning distribution. It is hardly new news, particularly on this blog, to note that this model has fallen apart. The most obvious culprit is that on the Internet, distribution, particular text and images, is effectively free, which meant that advertisers had new channels: first ad networks that operated at scale across publishers, and increasingly Facebook and Google who offer the power to reach the individual directly. I wrote about this progression in Popping the Publishing Bubble, and the intertwined functionality of publishers explains the downward spiral that followed: with less revenue there was less money for quality journalism (and a greater impetus to chase clicks), which meant a devaluing of the brand, which meant fewer readers, which led to even less money. What made this downward spiral particularly devastating is that, as demonstrated by the advertising shift, newspapers did not exist in a vacuum. Readers could read any newspaper, or digital-only publisher, or even individual bloggers. And, just as social media made it possible for advertisers to target individuals, it also made everyone a content creator pushing their own media into the same feed as everyone else: the brand didn’t matter at all, only the content, or, in a few exceptional cases, the individual authors, many of whom amassed massive followings of their own; one prominent example is Bill Simmons, the American sportswriter. Too much of the debate about monetization and the future of publishing in particular has artificially restricted itself to monetizing text. That constraint made sense in a physical world: a business that invested heavily in printing presses and delivery trucks didn’t really have a choice but to stick the product and the business model together, but now that everything — text, video, audio files, you name it — is 1’s and 0’s, what is the point in limiting one’s thinking to a particular configuration of those 1’s and 0’s? In fact, it’s more than possible that in the long-run the current state of publishing — massive scale driven by advertising on one hand, and one-person shops with low revenue numbers and even lower costs on the other — will end up being an aberration. Focused, quality-obsessed publications will take advantage of bundle economics to collect “stars” and monetize them through some combination of subscriptions (less likely) or alternate media forms. Said media forms, like podcasts, are tough to grow on their own, but again, that is what makes them such a great match for writing, which is perfect for growth but terrible for monetization. My back-of-the-envelope calculations estimated that Simmons’ Ringer podcast network was likely generating millions of dollars, and in an interview with Recode earlier this year, Simmons confirmed that is the case, claiming that podcast revenue was more than covering the cost of creating not just podcasts but the website that, at least in theory, created podcast listeners. The Ringer, a sports and culture website created by Bill Simmons, will soon be hosted on Vox Media’s platform but maintain editorial independence under a partnership announced on Tuesday. Mr. Simmons, a former ESPN personality, will keep ownership of The Ringer, but Vox will sell advertising for the site and share in the revenue. The Ringer will leave its current home on Medium, where it has been hosted since it began in June 2016. Simmons is exactly right about the benefits he gets from the deal: instead of building duplicative technology and ad sales infrastructure, The Ringer can simply use Vox Media’s. This is less important with regards to the technology (Vox’s insistence that Chorus is a meaningful differentiator notwithstanding) but hugely important when it comes to advertising. It’s not simply the expense of building an infrastructure for ad sales; the top line is even more critical: it is all but impossible to compete with Google and Facebook for advertising dollars without massive scale. Make no mistake, Simmons is the sort of writer that many advertisers would be happy to advertise next to (his podcast has had an impressive slate of brand names, in addition to the usual mainstays like Squarespace and Casper mattresses); the problem is that when it comes to the return-on-investment of buying ads, the “investment” — particularly time — is just as important as the “return”: a brand looking to advertise directly on premium media is far more likely to deal with Vox Media and its huge stable of sites than it is to do a relatively small deal with a site like The Ringer. Indeed, the bifurcation in the Internet’s impact on editorial and advertising — the former is becoming atomized, the latter consolidated — explains why the implications for Vox Media are, in my estimation, the more important takeaway from this deal. To date Vox Media has been a relatively traditional publisher, albeit one that has executed better than most: the company has built strong brands that attract audiences which can be monetized through advertising, and that revenue, along with venture capital, has been fed into an impressive editorial product that builds up the company’s brands. The Ringer, though, is not a Vox Media brand: it is Simmons’ brand, a point he emphasized in his statement, and that’s great news for Vox. The problem with editorial is that while the audience scales, production doesn’t: content still has to be created on an ongoing basis, and that means high variable costs. Infrastructure, though, does scale: Vox Media uses the same underlying technology for all of its sites, which is exactly what you would expect given that software can be replicated endlessly. Crucially, the same principle applies to advertising: one sales team can sell ads across any number of sites, and the more impressions the better. Presuming The Ringer ends up being not an outlier but rather the first of many similar deals,1 then that means that Vox Media has far more growth potential than it did as long as it was focused only on monetizing its owned-and-operated content. 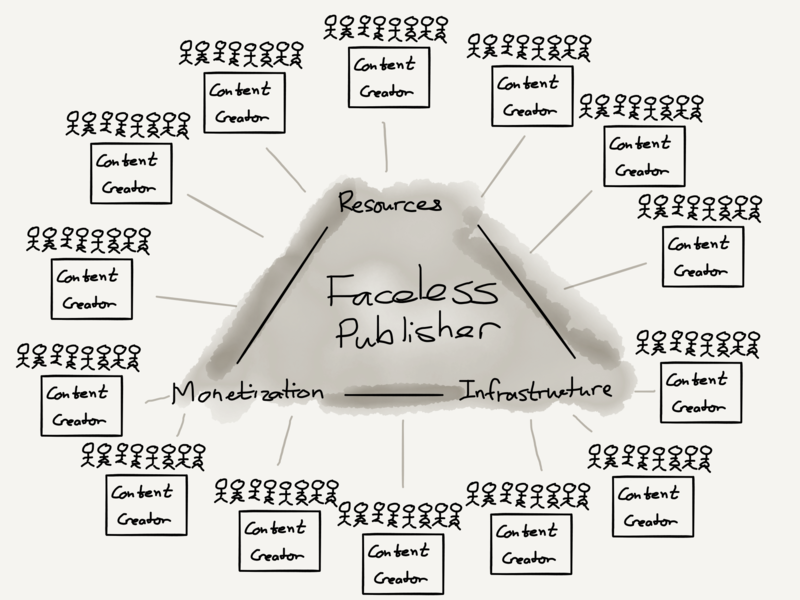 In this model the most effective and scalable publisher is faceless: atomized content creators, fueled by social media, build their own brands and develop their own audiences; the publisher, meanwhile, builds scale on the backside, across infrastructure, monetization, and even human-resource type functions.2 This last point makes a faceless publisher more than an ad network, and crucially, I suspect the greatest impact will not be (just) about ads. Earlier this month I wrote about the future of local news, which I argued would entail relatively small subscription-based publications. Said publications would be more viable were there a faceless publisher in place to provide technology, including subscription and customer support capabilities, and all of the other repeatable minutiae that comes with running a business. Publishers still matter, but much of what matters can be scaled and offered as a service without being tied to a brand and a specific set of content. I suspect this is part of the endgame for publishing on the Internet: free distribution blew up the link between editorial and publishing and drove them in opposite directions — atomization on one side and massively greater scale on the other. And now, that same reality makes possible a new model: a huge number of small publications backed by entities more concerned with building viable businesses than having memorable names.